Our goal is help to create the most functional and efficient café floor plan. ConceptDraw is a best Design software for the drawing Café Floor plans. ConceptDraw has many examples that helps you to start using software for designing Café Floor plans. Use they to develop the schematics of the furniture layout of the café hall. Solution Cafe and Restaurant Floor Plan from ConceptDraw Solution Park provides samples, templates and vector stencils libraries for drawing restaurant and cafe floor plans. Use ConceptDraw DIAGRAM diagramming and vector drawing software extended with Building Plans solution to draw your own restaurant and cafe floor plans. The Total Quality Management Diagram solution helps your organization visualize business and industrial processes. Create Total Quality Management diagrams for business process with ConceptDraw software. Find out why users prefer our storage layout plans. The first thing that your clients will see, is your restaurant's interior. It doesn’t matter, whether you own a Michelin-starred restaurant or a lunch counter, you will need a restaurant floor plan that will reflect every detail of the establishment’s interior. It is the second most important thing after the menu. Restaurant essentials include kitchen area, dining area, restrooms, bar area, staff quarters. Designing a layout of cafe and restaurant floor plan is a real art. 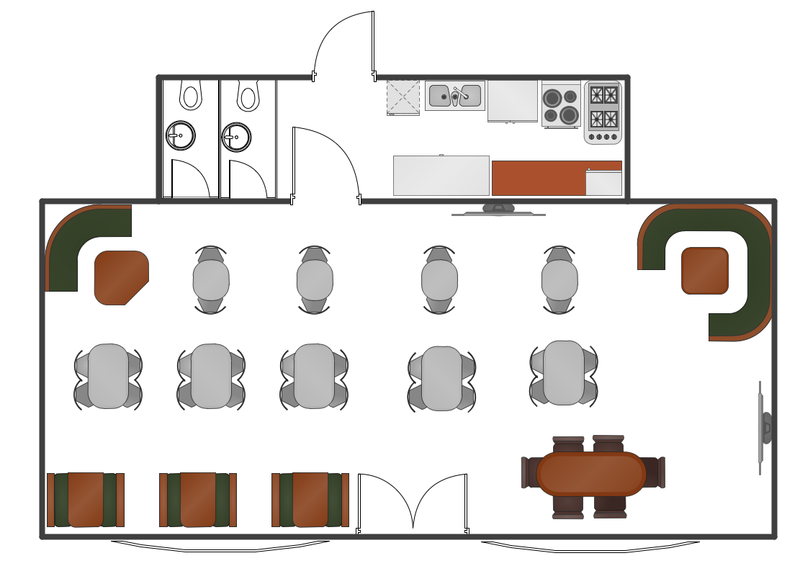 It should be beautiful restaurant seating plan which convenient for visitors. Restaurant essentials include kitchen area, dining area, restrooms, bar area, staff quarters. Being planned wisely a layout of restaurant floor plan and restaurant seating chart (cafe floor plan or bar) guides to prosperous sales and good profit. 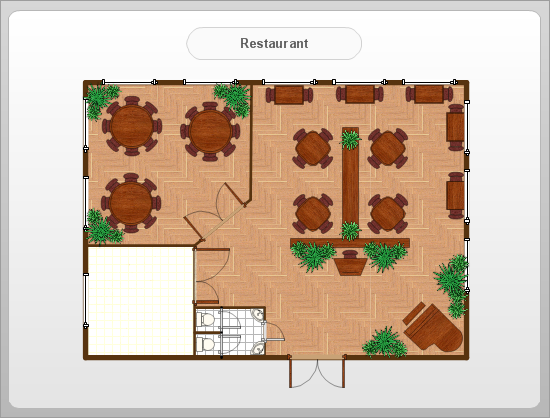 Making a restaurant floor plan or restaurant seating chart involves many different elements that can be managed using ConceptDraw Cafe and Restaurant Floor Plan solution. Cafe and Restaurant library delivers a number of vector graphic objects for depicting various layouts of any style and design establishments. 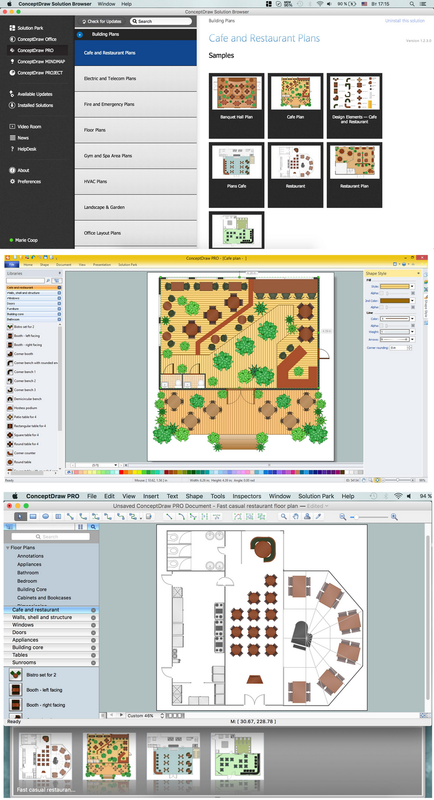 ConceptDraw DIAGRAM v12 is great and simple restaurant floor plan software with thousands features.